Are you a PADI certified diver, but haven’t been in the water lately? 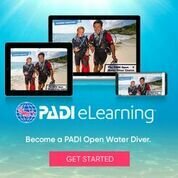 Are you looking to refresh your dive skills and knowledge? Getting ready to go on a dive trip and realize you haven’t been wet for a while or your c-card hasn’t seen the light of day. You should take a PADI Reactivate class with us. The cost of a PADI Reactivate pool session is $175.00 per person and participants must first purchase and complete the on line Reactivate program prior to any in water activity. Please use the link below to sign up and pay for the Reactivate academic portion. Student also need to provide their own Mask, Snorkel and Fins for the pool portion of the course. We offer the Reactivate pool session on Tuesday or Thursday evening, from the hours of 6pm to 10pm. Reservations are required so check your calendar and call to book a Reactivate pool session today.